"Baumann is an excellent musician, both as a soloist and as a collaborator in chamber works. The hallmarks of his playing are singing tone – he can sound operatic! – and the smoothness and evenness of his tone production, even on 'authentic' instruments." He pioneered the playing of early baroque and classical hand horns in performance, and his recovery from a serious stroke has been astonishing and inspiring. Hermann Rudolph Konrad Baumann was born in Hamburg, Germany in 1934. Perhaps it is not surprising that his horn playing is compared to singing since he started his musical career as a singer and jazz drummer, switching to horn at age 17. He studied horn with the eminent teacher and soloist Fritz Huth, then played with various orchestras for 12 years, including first horn with the Dortmund Orchestra and the Stuttgart Radio Symphony Orchestra. 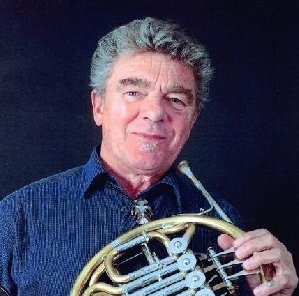 After winning the ARD International Music Competition in Munich in 1964, Baumann accepted a professorship at the Folkwang Hochschule in Essen and pursued a career as a horn soloist. Solo engagements, recitals, world touring, and recordings all followed, and he became known and admired throughout the world. Baumann's recordings on both modern and natural horn (including the corno da caccia) have received rave reviews. Baumann's fascination with the natural horn began at the Munich competition, when an audience member, Willi Aebi, a farm-machinery manufacturer from Switzerland, complained after his performance that Baumann didn't know the natural horn, but Aebi then invited Baumann to play his collection of natural horns and also presented him with an alphorn. Baumann taught many successful students at the Folkwang Hochschule in Essen during his 30-year tenure. One of his strong point in teaching, according to a student, was not to have his students copy him, but to respect each individual. He encouraged his students to practice together and attend concerts with him. Throughout the decades, he has lectured and given master classes around the world, continuing to participate in symposiums and other venues even in retirement. His wife of 40 years, Hella, a support for both Baumann and his students, died in 1997. Baumann commissioned works from such composers as Jean-Luc Darbellay, Bernhard Krol, and Hans-Georg Pflüger. He played the first performance of Ligeti's Trio for Horn, Violin, and Piano in 1982 to great acclaim from the composer. And he has composed his own works, notably the Elegia for hand horn. In 1999, the Historic Brass Society honored Baumann in Paris with the Christopher Monk Award for his outstanding lifelong contribution to music on period instruments. He has been known to play other natural horns – some not often found on the concert stage - such as the South African Kelphorn, the posthorn, and the Danish Lure. Baumann became an IHS Honorary Member in 1992, and the August 1998 issue of The Horn Call was devoted to him. In this issue, Baumann recounts his experience with the stroke that paralyzed his right side, and his difficult but successful recovery. Baumann had performed the Strauss Concerto No. 2 with the Buffalo Philharmonic and was discovered in his hotel room the next morning, hours after the stroke. After two weeks in a Buffalo clinic, he was transported to a rehabilitation clinic in Essen. He had to learn to walk, speak, write, hear, and eventually play horn again. He started teaching just five months after the stroke, and in two years was soloist and conductor at a gala concert.